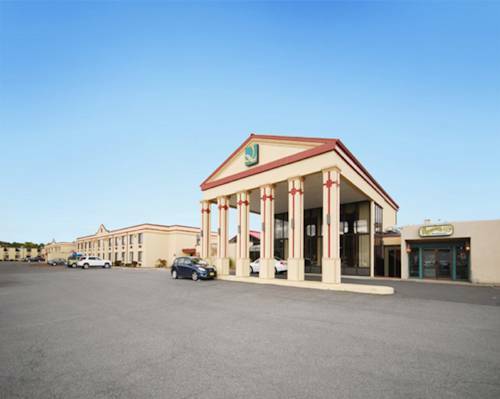 The Quality Inn and Suites hotel in Kingston, NY gives you real value with peace of mind. We are in the heart of the Catskill Mountains minutes from Woodstock, Belleayre Mountain and Hunter Mountain Ski Resorts. Catskill Park, Rhinebeck Town, Bard College and State University of New York at New Paltz are nearby. Enjoy amenities that include free hot breakfast, free WiFi, free weekday newspaper, free coffee, an indoor heated pool, fitness center, guest laundry services and a business center. Each guest room is equipped with a hair dryer, coffee maker, TV, iron and ironing board. Also, earn rewards including free nights and gift cards with our Choice Privileges Rewards program. Near the site of the 1969 Woodstock rock festival, a fiberglass bearded giant grooves in his tie-dyed shirt.